Sam Smith to tour South Africa. Cape Town — The popular singer left thousands of fans disappointed and worried after he stopped his performance midway due to voice strain. This was the first of three sold-out shows for April 16, 17 & 18 at the Grandwest Casino in Cape Town. Smith had rocked his Johannesburg performances at the Ticketpro Dome on 13 and 14 April. 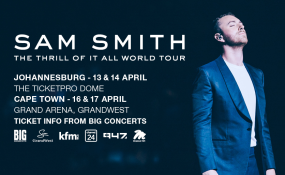 @BigConcerts - Sam Smith's CPT concert tonight has been cancelled. Unfortunately Sam Smith took strain to his voice & had to stop his performance. Ticket holders will be contacted directly. We will keep you posted with more info for the other CPT performances as it becomes available. Fans have expressed their well wishes. sir jorah mormont - So heartbroken 😞 the show ended midway now after strain to @samsmith's voice #SamSmithSA #TheThrillofItAll @BigConcerts. The British singer recently spoke about his struggles with depression and anxiety. In an Instagram post, Smith said he was experiencing a lot of anxiety and shared a video of a local fan singing along to one of his songs, which he said helped to cheer him up. The South Africa shows are part of his Thrill of it All tour which has stops all over the world, including Asia and Europe.